The Fellowship was fortunate enough to obtain a copy of SATELLITE FALLING #1 from IDW Publishing. Steve Horton writes, Stephen Thompson draws, Lisa Jackson colors, and Neil Uyetake letters. Lilly drives a cab on Satellite, an orbital city in which she is the only human. But that’s not her real job – she’s a bounty hunter. She left Earth to make a new start after the loss of Eva. Thanks to her tech she’s really good at her job, and she gets along well with the local constabulary. But now they’ve given her a job that’s proving to be more complicated than anyone imagined. She likes being the only human, but three years later she really hasn’t gotten over her loss. She’s a very well thought-out character, with talents and flaws – she seems very real in a world that seems very unreal. The adventure in this adventure story is also well constructed, with plenty of action and room for intrigue along the way. And the art really captures the essence of the essentially fantastic Satellite. Lilly has put herself in an awfully dangerous situation. And it’s going to be a whole lot of fun watching her get out of it. You’ll want to get on board with this one. 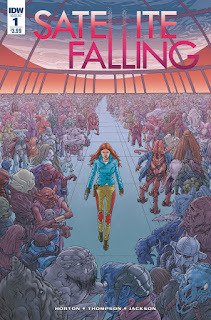 SATELLITE FALLING #1 is available now at your FLCS or at idwpublishing.com.